(Bloomberg Opinion) -- To have one airline limping forward on the brink of bankruptcy may be regarded as a misfortune. To have two looks like carelessness. Facing collapse, Jet has been trying to restructure its debt and seeking bailout money from founder Naresh Goyal and leading shareholder Etihad Airways PJSC. Should those attempts fail, Prime Minister Narendra Modi will have to explain the loss of 23,000 jobs ahead of May elections. Air India, known locally as the Maharajah, has been in similarly dire straits. An attempted privatization last year attracted zero expressions of interest. The government is considering a fresh turnaround plan, the Indian Express reported in September. The problems are interlinked. Due in large part to excessive fleet acquisitions during the 2000s, the Maharajah has been crushed under the weight of his spending. Net debt was about 454 billion rupees ($6.4 billion) in March 2017, the last time Air India published a balance sheet. Debt has since risen to about 519 billion rupees, according to the Times of India. 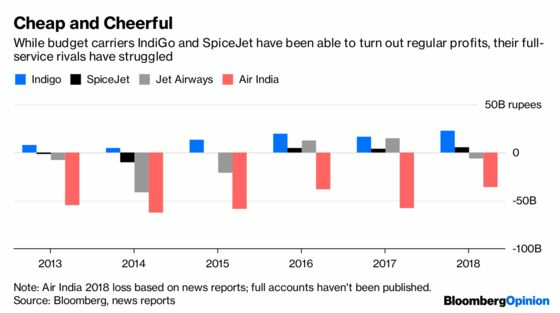 If it wants revenue to pay that mounting bill, Air India must somehow maintain its market share, in spite of notoriously bad service and on-time performance, and competition from budget upstarts SpiceJet Ltd. and InterGlobe Aviation Ltd., or IndiGo. The tactic it’s used to thread that needle has made matters worse: discounting. Have a look at the passenger yields for the big four carriers reported to India’s Directorate General of Civil Aviation and you’ll see the problem. 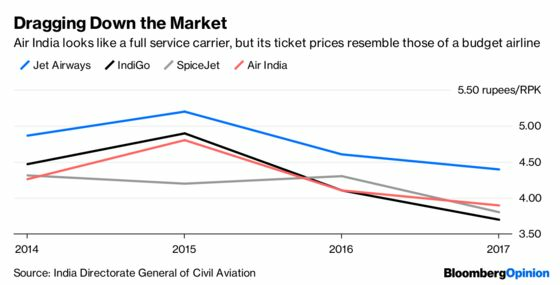 While Jet has kept yield — a measure of passenger revenue, per seat, per kilometer — at a decent premium to IndiGo and SpiceJet, Air India has been busy matching or even undercutting the no-frills competitors. That’s not really helped anybody. With its bloated balance sheet, the Maharajah would probably be losing money regardless of what it does (finance costs and depreciation alone typically chew up about 30 percent of revenue, compared with 5 percent or so at Jet). 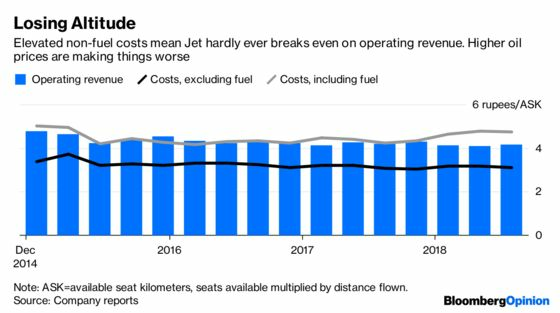 But Jet has long been tantalizingly close to covering its costs. Were it not for the necessity of competing for full-service passengers with a rival that doesn’t seriously expect to break even, it might even be able to make a profit. Of course, life would still be tough given fearsome competition from IndiGo, as my colleague Andy Mukherjee wrote earlier this month. Still, full-service carriers do manage to survive and even thrive in markets transformed by the budget aviation revolution, as the experience of incumbents competing against Southwest Airlines Co., Ryanair Holdings Plc and AirAsia Group Bhd. has demonstrated. What’s unique about India is that the top end of the market is in the grip of the same deflationary mania as the bottom bucket. The answer is to kill two birds with one stone. 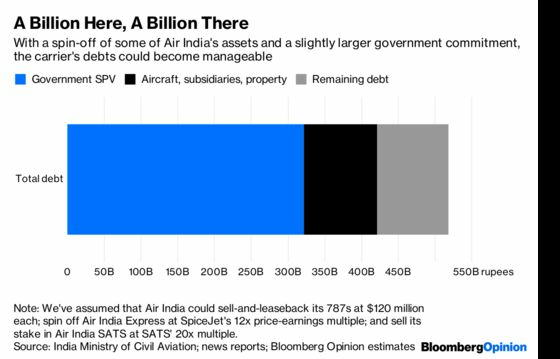 Jet quickly ruled out a bid for Air India when its privatization was put out to tender last year, but a sweetened deal that wiped out more of the state-owned carrier’s debt might be enough to put the combined group on a stable footing. Combined Ebitda at the two companies averaged about 55 billion rupees in their 2016 and 2017 financial years. If New Delhi absorbed another 80 billion rupees of debt on top of the roughly 250 billion rupees it committed to under last year’s privatization plan; sold and leased back Air India’s six remaining fully owned Boeing Co. 787s; and spun off its budget carrier, ground handling business, and property portfolio; then the aggregate debt bill for the two companies could fall to a high-but-manageable 200 billion rupees or so. That 3.6 times net debt-to-Ebitda ratio would drop to still more comfortable levels if the combined group was able to lift ticket prices, something that would be easier in the absence of Air India’s suicidal discounting. Luckily, the seasoned professional management that the Maharajah so desperately needs would be on hand in the shape of Goyal, Jet’s chairman, and his executive team. Such an airline would still need to work hard to escape its legacy of losses — but it would at least have a chance to become a robust global aviation player. That should be considered the birthright of a country that already has the world’s largest diaspora and fastest-growing aviation market, and will soon have the largest middle class. Given the politically hazardous need for state banks to absorb losses, it’s unlikely that any such resolution will come before the elections. But Modi, or his successor, shouldn’t regard kicking the can down the road on Air India’s debts as the low-risk option. The Maharajah’s 2012 government bailout was one of the final straws contributing to the collapse of Kingfisher Airlines Ltd., which had once aspired to be a third full-service player. New Delhi should take care that history doesn’t repeat itself.